The heart regularly speeds up or down its beating frequency to adjust to the body’s needs. Even in stable conditions (when you’re not particularly active or your active for a constant time), the amount of time between heart beats is variable. A team of doctors and engineers at Caltech’s Division of Engineering and Applied Science have now found a better way to assess how heart rate variability (HRV) affects bodily functions and health in general. The findings suggest that heart rate variability is a good thing and might help scientists devise better monitoring technologies for athletes and medical professionals. Complex systems like airplanes, cars, computer networks or, of course, the human body are comprised of a myriad of state variables that are in relation to one another. If one variable must remain stable to maintain a healthy system, another variable must be able to flex to maintain that stability. Mapping each individual variable during a process is far too complex, so engineers employ a branch of mathematics called control theory to summarize the ups and downs in a system and pinpoint the source of a possible problem. The sort of reasoning engineers apply in control theory for mechanical systems, it seems, works just as well for the human body. In order for a body to work optimally, it must operate in an environment of stability called homeostasis. When the body experiences stress—for example, from exercise or extreme temperatures—it can maintain a stable blood pressure and constant body temperature in part by dialing the heart rate up or down. This is where HRC comes in. “A familiar related problem is in driving,” Doyle says. “To get to a destination despite varying weather and traffic conditions, any driver—even a robotic one—will change factors such as acceleration, braking, steering, and wipers. If these factors suddenly became frozen and unchangeable while the car was still moving, it would be a nearly certain predictor that a crash was imminent. Similarly, loss of heart rate variability predicts some kind of malfunction or ‘crash,’ often before there are any other indications,” he says. To understand how HRC relates to an automobile’s ‘cruise control’, the team measured the heart rate, respiration rate, oxygen consumption, and carbon dioxide generation of five healthy young athletes as they completed experimental exercise routines on stationary bicycles. By comparing the results with standard models of the physiological control mechanisms in the human body, researchers could pinpoint the essential tradeoffs that are necessary for athletes to produce enough power to maintain an exercise workload while also maintaining the internal homeostasis of their vital signs. Data introduced in control theory models suggest that a healthy heart must beat at a variable frequency to keep this complicated system in balance. Indeed, previous studies have linked a drop in HRV as a predictor for fatigue and overtraining in athletes. 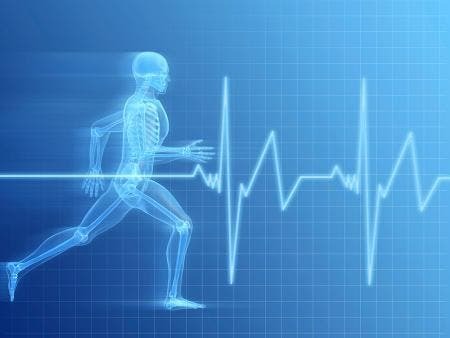 In the long term, low HRV may correspond to a number of illnesses, such as congestive heart failure and inflammation. Athletes could also employ a similar, portable system that will notify them when they’re in danger of becoming too fatigued. Most modern hospitals already employ sensors that monitor HRV for patients. Combining this monitoring data with a control theory algorithm might offers doctors with more specific and precise means of setting a diagnosis. Findings appeared in the journal Proceedings of the National Academy of Sciences.